Robot Warfare is an action MMO game where you are fighting with mechs. And it is published and created by Azur Games. We all know this publisher and we know that they can make good games. And now we have this mech war game. Let`s make a review and see what we have here. Because we all know that when we are talking about mechs, there is only one game that can stand up and this is Mech Warrior. And so this is Robot Warfare. Okay, so it’s not Mechwarrior, not by any means, but damned if it isn’t fun. There are mechs, there are guns, there are missiles, and there are other interesting mechs to meet and then kill. What more could you want? So first of all, you start out with a single mech, and it’s a bit small, but all good things start out small…sometimes. Well, a mech is kind of big no matter how you want to slice the cake. In any case, it’s been a long time since I’ve gotten to feel the thrill of trashing a battlefield with a walking mech. I’m not going to say it was exactly like the old days, but it was good enough to keep me planted on my phone for like four days. 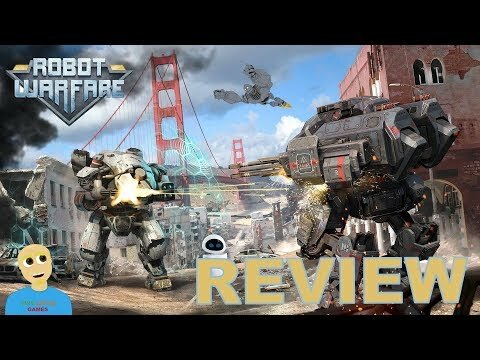 And now let’s get to the gameplay review of Robot Warfare. What I absolutely love about this game is that it doesn’t start by throwing you into some ridiculous tutorial. Instead, it simply gives you your mech, all the options, and a ‘To Battle’ button in the upper right-hand corner. How much easier could it possibly be? If you are familiar at all with how games like this work, then jumping right it won’t be a problem. One thing you should note is that you can aim your weapon while holding down the fire button, and you’re going to be holding down that button a LOT. One of the best things in Robot Warfare is that the action starts right away and it is so simple. Destroy everything and everybody. What more you need in a mech game? There are three maps, all of which involve the same ‘point capture’ game mode that you see in Battlefield, Battlefront, and virtually every other shooter. I kind of wish that they had included other game modes but you know what, the game is fun as is. Essentially, the point of the game is to destroy the other mechs while capturing as many points as possible. You can win by either destroying all of the enemy mechs or going so far as to actually capture all of the points. Be warned, however, that once one side has captured enough points, the game will end sooner rather than later. This is my favorite mobile mech game.